Do you ever take the time to stop and admire the specific patterns on a wood door? It’s not something you usually notice or take the time to appreciate. Wood doors are everywhere. In our minds, they’re part of the usual scenery. Most doors, however, aren’t solid wood. They are created by a process called veneer cutting. To make sure you’re familiar with veneer cuts, let’s do a quick review: Veneer cutting is a slicing method that creates thin layers of wood that can be pieced together for exterior surfaces on furniture, doors, cabinets, and more. There are several different kinds of ways of slicing the wood to give unique looks in the patterns of the grain. 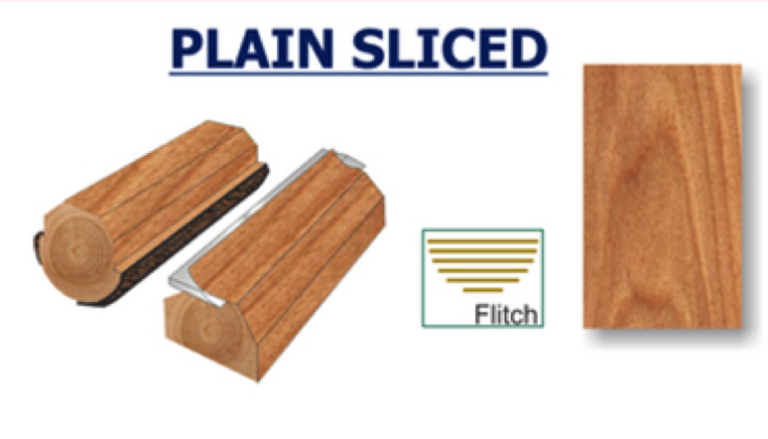 Plain Slicing is a common method used for high quality architectural woodworking. The log is sliced parallel in a line through the center. Then, a cut parallel to the length of the log is made. This produces the standard look of veneer cuts, which is the “cathedral or flame arch shape. This cut of veneer is usually used for doors, wall panels, and furniture because of the consistency in the grain. 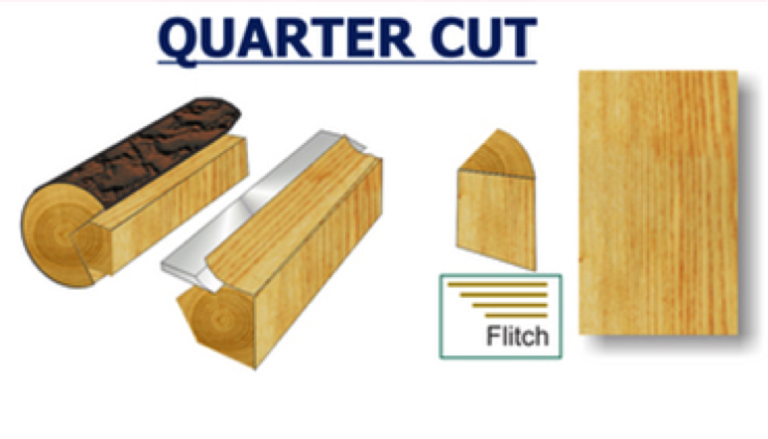 Quarterly Cut is done by mounting a quarter of a log so that the growth rings are perpendicular to the blade. Quarter slices are narrower than plain slices, which makes them easy to match. Rotary Cut is done by placing the entire log on the lathe. Once the log is placed, the blade cuts a continuous section of wood. 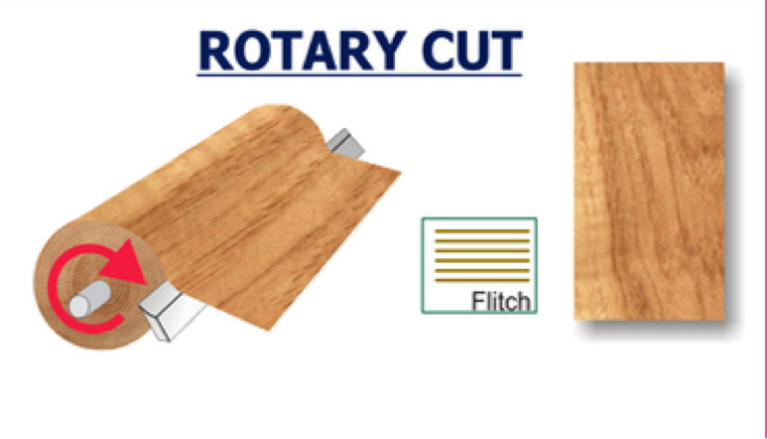 Rotary slicing is the most economical method of veneer cutting. However, it’s difficult to create consistent patterns with this method due to the inconsistency of the grain patterns. Rift slicing achieves a straight grain pattern, but avoids the “flake” look that comes from some quarter slicing. A quarter of the log is cut with a rotary action. The rift grain is usually the straightest and free from the “cathedrals” and variation in grain. It is used to enhance a vertical grain in the wood that can be easily matched and sequenced. Once the cuts have been made then you can match them to create the look you desire. Most matches are done with sliced veneers. The most common type is the “book match” where every other slice of veneer is flipped over so adjacent leaves are “opened” like the pages of a book. This creates a mirror-like image pattern. 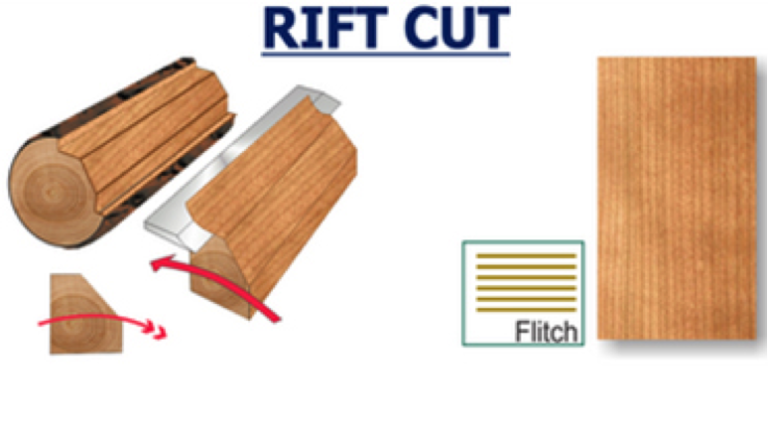 Quarter Sliced and Rift Cuts often make a “slip match” because when they are placed in sequence they create a pattern. And lastly, there are “random matches” where the cuts are placed together and form a random pattern.